I don’t know why, but I’ve been on a chocolate kick lately. Paleo hot chocolate, chocolate-dipped macaroons, and now this. I wanted to make some chocolate milk but we didn’t have any of the powdered stuff or chocolate syrup, so I whipped up my own. It was so easy that I’m wondering why I haven’t been making my own all along. Mine is also definitely lower sugar than the store-bought kinds, and I got to use my awesome organic cocoa powder too. So it’s super-delicious. 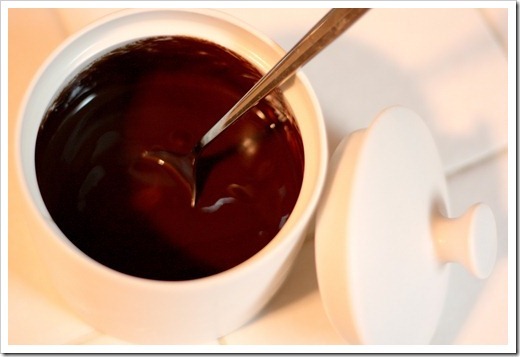 It can be stirred into cold milk for chocolate milk, and no doubt would work in hot milk for hot cocoa too. It would also be a great ice cream topper. I’m also thinking it would be delicious swirled into some Greek yogurt, maybe with crushed raspberries. Just made this yesterday, and it’s superb! Tried a mocha first, and made a hot chocolate. 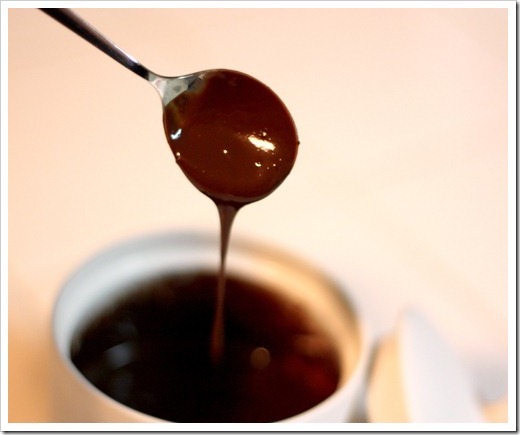 Put some of the choc sauce into a warmed mug (about a tbsp) Heat up milk in the microwave, froth lightly and addslowly to the mug, stirring as you go. Perfectly rich! Would be an ideal profiterole topping. Waw!! What a divine & tasty recipe!! The endresult looks splendid! Yummie food! WOW! This looks absolutely amazing. And easy! I think you’re craving food chocolate because you’re missing me, your REAL chocolate! 😉 Love you! Joyyyy!!! I really hope we get to get together at Xmastime! Then I can MWAH you.